There are three main routes to hike Skiddaw mountain, the main hiking trail is from Keswick town, or from the car park above Keswick, another from the Mirehouse car park for the steep west route, and a third from a car park at the Orthwaite hill road for the long ridge north route. The image below is from the Booths store in the centre of Keswick, showing the 3054ft Skiddaw mountain sitting high above the town. The car park in the image, up on the hills, is about 950 ft above sea level, so makes the hike a fair bit easier than from Keswick, that is about 260 ft above sea level. The trail from Keswick leaves from Brundholme Road and goes up Spoonygreen Lane, over the main road by bridge to the the hill named Latrigg, then through the top car park as seen in the image below. You will normally see many cars parked on the roadside along Brundholme Road, either side of Spoonygreen Lane. The image below is of the hiking car park for the main hike up the south side of Skiddaw mountain. To get to this car park, go to the large roundabout on the A66 at Keswick, there only is one, take the A591 for Carlisle, then after only about 50 yards, take the hill road marked for Ormathwaite. The narrow road up is well marked and has many passing places. This car park is about 950ft above sea level. The hiking trail up from Keswick, over Latrigg Hill, comes through this car park, it is part of the Cumbria Way. The image below is from just round from the car park, at the monument looking straight up the steepest section of the hike. The top of the steep section there, up to the first ridge, is about 2,030ft, so over 1000 ft of real tough hiking, it is steeper than it looks from here. This memorial is for the shepherds Edward Hawell and his son Joseph, who reared Herdwick sheep on these lands from the mid to late 1800s. The image below is from the top of the steep section at just over 2,000ft. The trail has a steady incline from here to the top of Skiddaw, by hiking straight past the 2837 ft Little Man with two peaks, as seen up to the left there. The image below is from where the trail splits, left up to Little Man, or straight ahead for a steady hike up to Skiddaw summit. The image below is of the main trail as it leads straight to Skiddaw. This is the best man made path I have ever hiked, with the top section having a steady incline. The mountain is quite exposed, so even in a warm spell, there was a cool breeze. The image below is of the summit of Skiddaw mountain when approaching from the main south trail. This seemed a nice hike, after forgetting about the steep section just above the car park. The image below is from walking along the top of Skiddaw and looking down the west side. That trail leading down the southwest ridge, takes you to the very small village of Millbrook. Don't think there are many car parking places in Millbrook. That trail can also lead down through Dodd Wood to the large car park at Mirehouse, where there is a tearoom and osprey viewing place. The image below is also looking down the west side of Skiddaw at the northwest route up the long ridge from the Orthwaite hill road. There is a car park next to the Orthwaite hill road that holds about 6 cars. Looks a real nice route up. The image below is from Trig Point on Skiddaw looking back down the main south trail. This image shows the skiddaw trail going round Little Man, and the trail over the top of Little Man. There is a viewing cairn on top here with a brass plate showing all the main attractions around Cumbria, as in a clear day, you can see for miles all around. The image below is from hiking back down the main south trail and looking down to Keswick and Derwent Water. This is why I hike in sunny days, for views like this, and I always seem to get lost in cloud. The image below is from the 2,837ft Little Man heading back down to the main Skiddaw trail. The image below is looking down the steep section to the car park, showing just how steep this section is. Note the trail down into Keswick from the car park. That is the 3,209ft Scafell Pike in the distance, about 9 miles south of Keswick on the B5289 with a car park at Seathwaite Farm by Borrowdale for that hike. There are 3 more mountains over 3,000ft next to Scafell Pike. The 3,117ft Helvellyn is about 7 miles south of Keswick, with a large car park named Thirlmere next to the A591 for the steep west route up that mountain. Helvellyn is the third highest mountain in England, after Scafell Pike and Scafell. 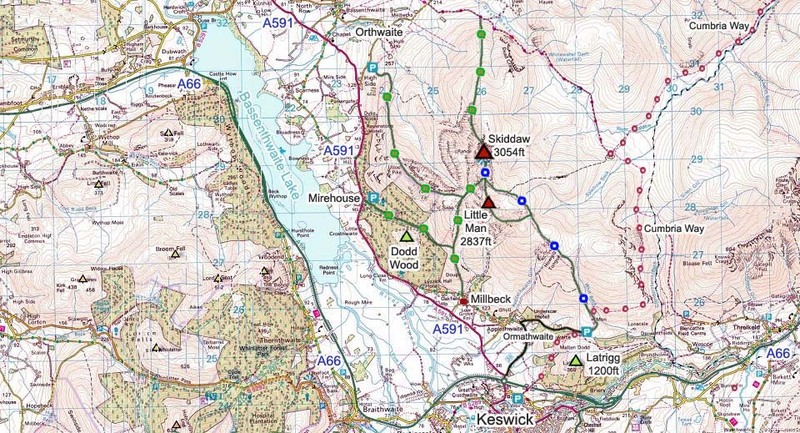 The Skiddaw Map below shows many of the routes onto this mountain. Not sure if there is any parking in Millbreck. The Orthwaite hill road car park only holds about 6 cars. The Ormathwaite and Mirehouse car parks are large. This was a tough hike to start of with, then a pleasant hike the rest of the way. There was a cool breeze most of the time, making the hike in the summer really enjoyable. The other routes up from the southwest and northwest look more testing, a mountain that can be hiked on a few occasions. Make sure and take an Ordnance Survey Map and Compass on these hikes, and know how to use them, as in cloud, these mountains can be deadly. In Winter, make sure you have Crampons and an Ice Axe, and know how to use them. Photo Tour of the Skafell Pike from the north 9 miles south of Keswick.